A week ago Sunday, my friend Barclay called me. “It’s a beautiful day, let’s canoe the Rockaway River!” Why not? With recent rain, the river was high and running fast. Twenty minutes later, we hit a strainer and went for a swim. By the time we reached the takeout, I was borderline hypothermic and wondering if I’d blown my chances to race. Fast forward to this past Saturday: as my Subaru clawed its way up 13th Lake Road to Garnet Hill, the car thermometer stayed put, at zero. A frosty welcome for Hudson United Race Team’s (HURT) Mega Relay. Nothing like a bit of zero degree temperatures for a ski race. I hoped it would be warmer than the Rockaway River. 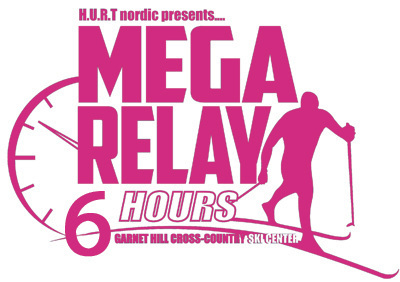 Teams for the Mega Relay can run from three to eight persons and be all-male, all-female, or mixed. The teams that ski the most laps in six hours win. If you’re 13-15 years old, or 45-64 years old, each lap counts as one and a half laps. Kid age 12 and under were allowed to ski laps simultaneously together and all of them counted. For ages 16-44, a lap was a lap. From 10 AM until 4 PM, you keep tagging off. If you’re still out on course at 4 PM, that last lap doesn’t count. 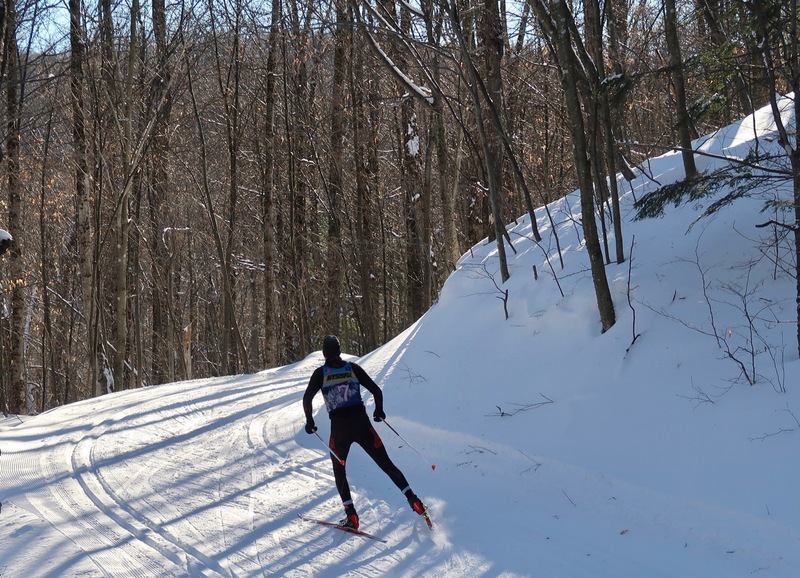 HURT, the host club, laid out a four kilometer lap on the trail network of Garnet Hill Lodge. At the start, there’s an undulating 22 meter climb, then a fast, looping downhill. The next couple kilometers are fast and rolling, with some fun downhills. Then you turn back towards the ski center, go over a few rollers, and climb back up to the ski center to finish the lap. Last year, I blew myself out on my first two shifts and crawled through two more. I didn’t want to repeat that experience. 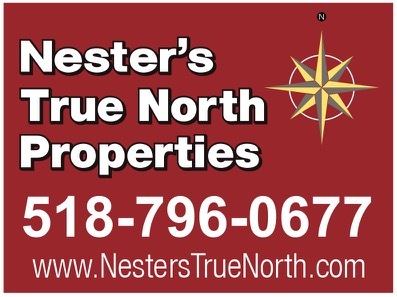 This year, my club, Peru Nordic, fielded two teams. Betsey Richert, Ed Lis, and I were team Evil Knows No Boundaries, and we agreed we’d ski two four kilometer laps per shift. On this day, I scrambled at the start and managed to stay out of trouble. 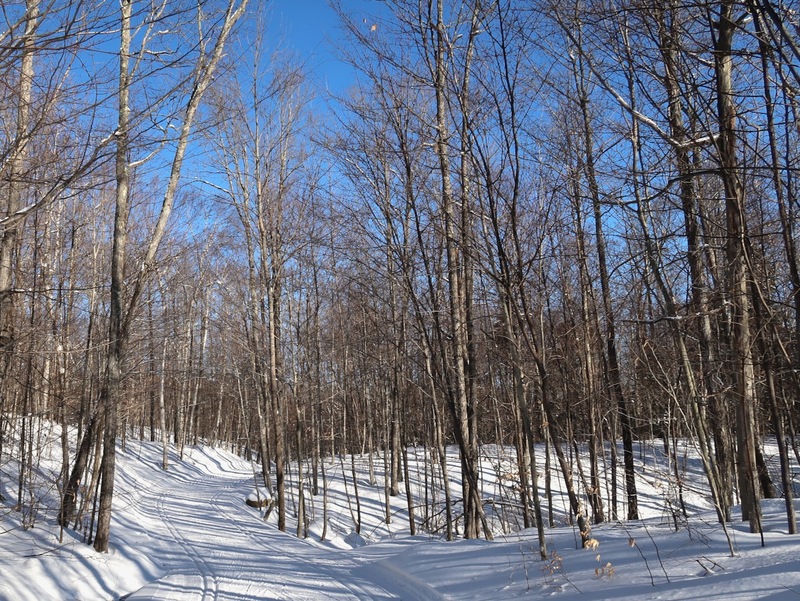 Laid out in 1970, the ski trails were designed before skating hit and for the most part, they’re a bit on the narrow side. Through my first shift, I kept checking my heart rate and it was higher than I wanted – the same numbers that got me in trouble last year. I focused on skiing quick and light, and tagged off to Ed. Betsey tagged me and I set out for my second shift, determined not to bury myself. To moderate my heart rate, I resorted to the coach’s skate on the first uphill. With two laps already in the books, I knew the course and attacked the downhills, carrying more speed. My Achilles’ heel came at the end of the first lap, where you climb from the low point of the course, through the stadium, and up to the lodge. That’s 59 meters of suffering. A high school boy blasted by me as I got to the top and I thought, god, what’s it like to be young and bulletproof? Tagging off to Ed, I went into the ski center to change out of wet clothes, eat and drink. 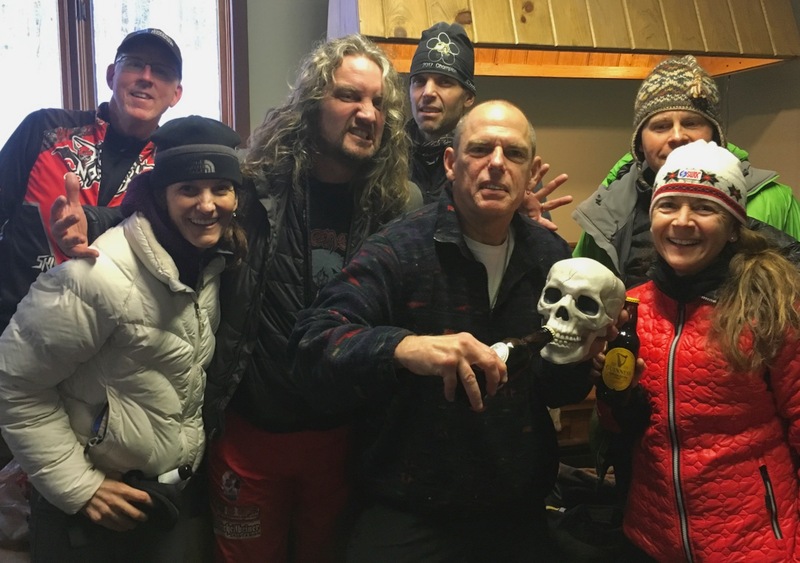 I would have loved to stretch, but the lodge was full with athletes, friends, parents, mountains of clothing, and non-racing skiers. At the end of my third shift, I saw Harvey in the stadium! After all the email and phone conversations, it was a pleasure to meet him for real. A couple nights before, he’d proposed coming to take photos for my race write-up on the blog. We chatted in the big common room before he went back out for more pictures. My fourth shift came near 3 PM. At this point in the day, (sh)it gets real. Three times you’ve skied eight kilometers, had enough of a break to stiffen up, and gone back out again. In hopes of getting an extra lap in before the 4 PM finish, we reduced our shifts to one lap each. I clicked back in and noticed the temperature was dropping. One thumb was cold almost immediately as my glove was worn and not completely dry. By now my legs have accumulated a decent amount of lactic acid, and I check speed on a couple of cranking downhill turns rather than risk a fall. Focus on smooth and light. Keep up on the last climb. Tag off to Ed. Ed Lis finished strong for our team as the trails fell into shadow. 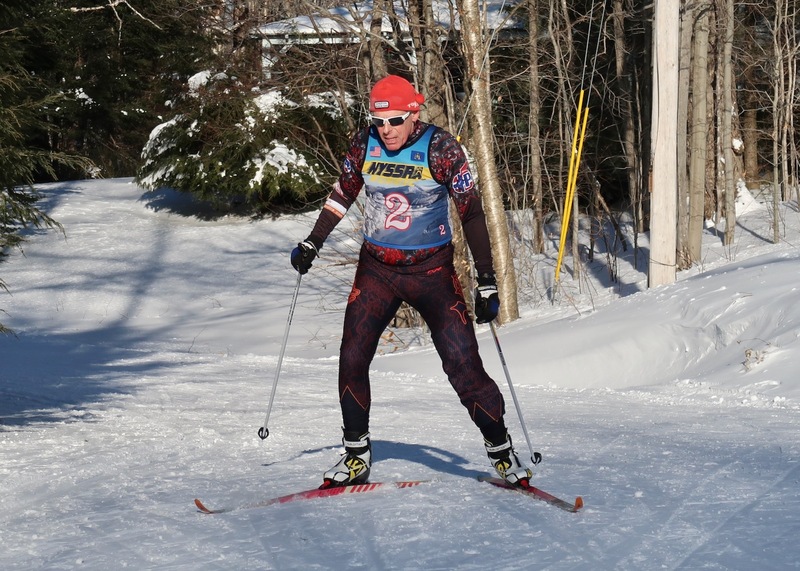 At the awards ceremony, Peru Nordic’s Die by the Sword team took mixed team honors. We may not have won anything, but I skied even splits through every shift and I was only partially wrecked at the end of the day. I felt good enough that I decided to stay over Saturday night and explore the Garnet Hill trail network the next day. But that’s a story for another time. Really cool story. I love seeing all the action return to Garnet Hill Lodge, it’s really fun to watch and hear about. @ Raving Mad Tele-Chick Thank you, I didn’t make time to make a smoothie this time around. I find that if it’s all fruit, I’ll have a sugar crash. For a recovery smoothie or lunch, I like to mix ginger, turmeric, protein powder, a banana, wheatgrass, spinach and coconut milk. Works pretty well. You’re the man, Peter. I tried to get to GH earlier this year… it is going to happen soon for sure. Glad the Delaware is shallow too! @ml242: Actually it was the Rockaway River, right in my backyard. Thankful it was only slightly more than waist deep. 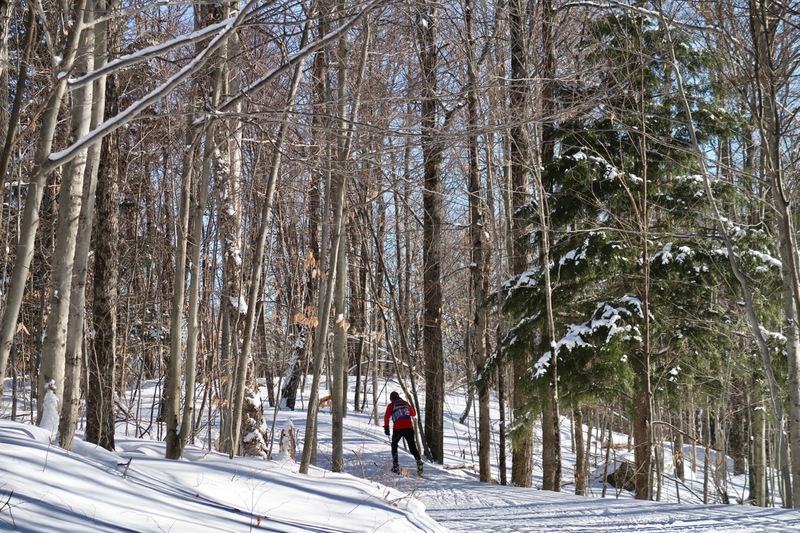 As for GH, on Sunday I did an easy ski to explore, I’m unfamiliar with the trails there. It was really nice and some of the scenery had a vibe similar to the Sugarbush VT area. Peter it was great to meet and see you, and ski, and work together on this piece. 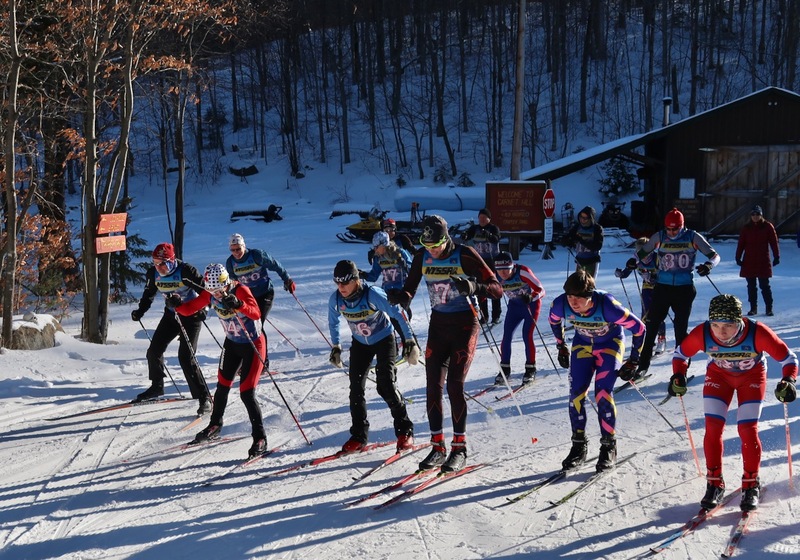 It’s a huge effort that race, nice job Peru Nordic and all. I think I’ve said it before but I respect the hell out of you Nordic guys. Looks like more work then I put into my whole season. Great story.